What would the door to hell look like? If someone were to ask you to describe the door to hell or the gate to hell, how would you accomplish this task? Many people believe that it is more than adequately portrayed in the Karakum desert located in Turkmenistan. 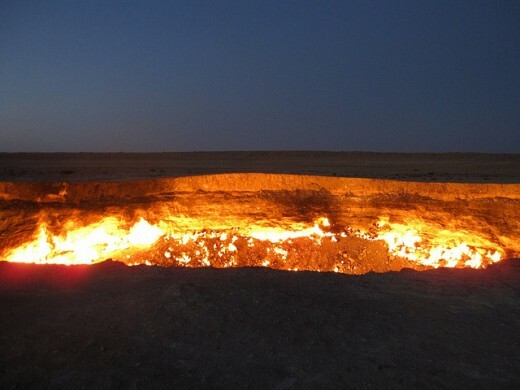 Located in the Karakum desert, close to Darvaza, Turkmenistan, is a huge hole (the Door to Hell) that has been burning for a long time. How long? There are mixed reports. Some say it has been burning since the 1950’s; and others indicating that it has been burning for over 200 years; but most agree that the fire started in the early 1970’s. Turkmenistan has one of the largest gas reservoirs in the world. The Darvaza area is known to be an area rich in natural gas deposits. It is reported that in the early 1970’s, at the aforementioned location which at the time was a part of the USSR, Soviet geologists looking for pockets of natural gas were drilling a hole to extract the gas from a huge underground deposit. While excavating at the site, they unexpectedly encountered a huge underground cavity filled with natural gas. The earth under the drilling platform completely collapsed swallowing the drilling rig in its massive maw. All that remained was an enormous burning hole about 230 feet (70 meters) in diameter and 65 feet (20 meters deep). In order to prevent the poisonous methane gas from escaping into the atmosphere, the hole was flared and then allowed to burn. At the time, it was thought that the fire would consume all its fuel and extinguish itself in a few days. 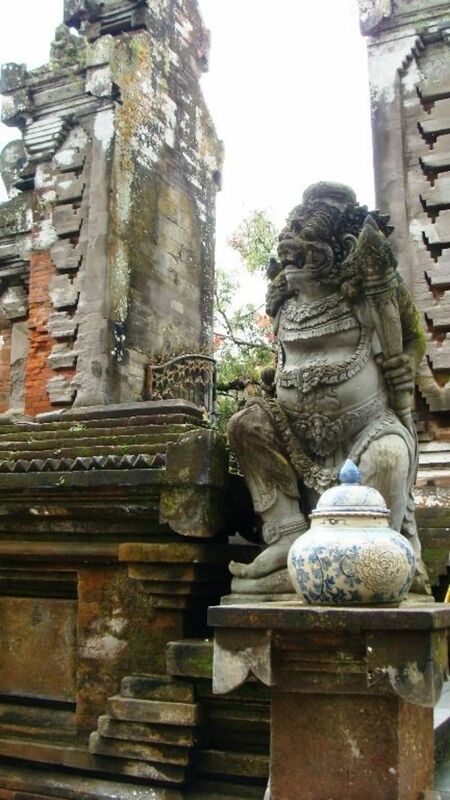 The "Door to Hell" has, however, burned continuously since that day. Once the entire drilling site collapsed into the crater, geologists had a decision to make. The concentration of the gases was so extreme, if the gas was not contained by some method, the fumes would have overwhelmed the residents of the nearby town of Darvaza. The geologists decided to allow the gas to burn itself out. Burning or flaring was much safer and friendlier to the environment than allowing the poisonous methane gas to be freely released into the environment. Methane is a very potent greenhouse gas with a significantly high global warming potential of 72 averaged over a 20 year period or 25 averaged over a 100 year period. This seemingly infinite pocket of methane gas has burned unceasingly since that time and shows no signs of weakening anytime soon. 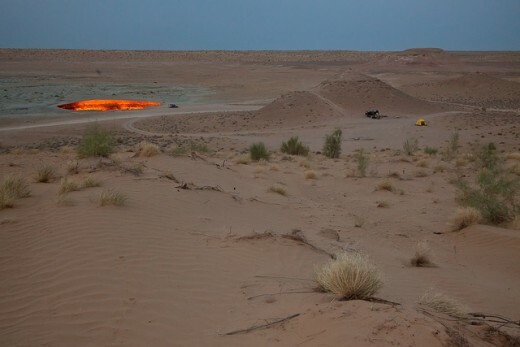 Residents of Darvaza, numbering approximately 350, have dubbed this flaming gas crater, the “Door to Hell.” This inferno’s flames, which casts a menacing glow in the cover of darkness that can be observed for miles, dancing and licking at the air reinforces the idea of hell to all who have beheld this terrifyingly awesome and breath-taking sight. Watch the video below and you can get a small taste of the terror of hell. You can even hear the licking of the flames! Thinking the hole would burn itself out in a few days, no one ventured into the massive crater at the time that it collapsed upon itself; and no one has entered it since either. The terrifying aspect of hell along with its vicious fires has stopped all that would dare. Looking into this massive hole of unceasing flames, it is easy to see why the locals have named this site, the “Door to Hell”. When viewing this massive hole of flames that seems to feed on the air itself, it is easy to imagine this is way hell must look – feeding on the souls of the damned. Is the “Door to Hell” Real? Checking with hoax-slayer, they indicate that the photographs of this site near Darvaza are genuine, but any descriptions of the “Door to Hell” are unsubstantiated. The first time I personally became aware of the flaming crater near Darvaza was via an email a few years back. Hoax-slayer indicates that information about the “Door to Hell” has been circulated by email, blogs and various online communities for many years now. John Bradley has taken a series of photos of the fiery gas crater that can be viewed here. Below you can see additional video footage. Where in the world is Darvaza, Turkmenistan? This is just one of many holes that penetrate deeply into the crust of the earth. This hole, however, is the only one filled with an unlimited source of flames - best representing the Door to Hell! What do you think? Does this hole look like it could be the entrance to hell? 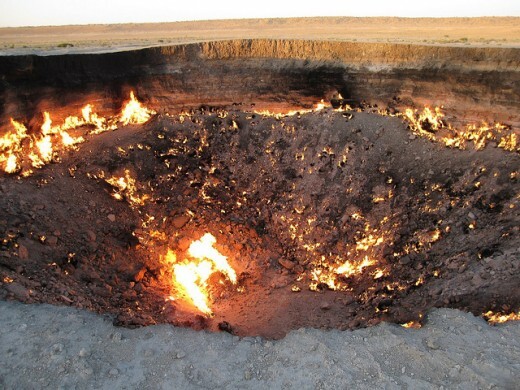 Comments: "The Door to Hell ~ Flaming Gas Crater in Darvaza, Turkmenistan (formerly USSR or Russia)"
Although you and I know it is not the true door to hell, it certainly looks like it could fit the bill. So glad you enjoyed it! This is not the door to hell for sure. God has created hell and heaven somewhere else, we will only know where that is when we die. Interesting article, enjoyed reading it. unknown spy - I thought this was really interesting myself when I saw it several years ago. And to think, it could burn forever - just like a true gate to hell! Thanks so much for stopping by! Wow Awesome!! I never knew this "door to hell" existed. it was like on the story i heard a long time ago. Thanks, so amazing, and it was there burning like forever. so glad to be able to share this with you. Thanks for stopping by! Fascinating stuff. Thanks for the Hoax-Slayer link,too! Ardie - I would not want to go into this thing either. Who's to say that there wasn't another sinkhole under that one just waiting to give way. I a glad that I was able to introduce you to this phenomenon. ithabise - I am pleased that I was able to introduce you to something new and interesting. You are quite welcome. Thanks to both of you for stopping by. I really do appreciate it. Well I have learned something new and really interesting! Thank you for this. ThoughtSandwiches - I am pleased that you enjoyed this one Thomas. It really is eerie isn't it? Brittanytodd - Glad you enjoyed it! Wow! These photos are breathtaking! Thanks for sharing, Cindy. I don't know if you are a fan of the Simpsons...but this reminds me of their Springfield Tire Fire that has been burning for days! I would have hated to have been on that drill platform back in the day! Great job with eerie as hell pictures! nityanandagaurang - I have heard that. I intend to investigate some of them as well. Thanks so much! amazing information,there are number holes in the earth like this hmeesteadbound.Voting it up. Not a problem =) Thanks again for a great hub and a fun conversation! Great, tehgyb! I appreciate you returning with the information so quickly! Thanks so much! A quick google search popped up like dozens of sites explaining it off as a hoax and citing the origination of the story. It is all fine. We never did come out and say it was a hoax, you clarified the situation. All is good. Thanks so much. People will know for sure now. Where did you check it out as being a hoax? Snopes? tehgyb - Yes, AfricaResource clarified it as being an audio snippet from a film (referring to their comment 3 up), and I knew it was not real, but it does make things interesting! Thanks so much. I hate hoaxes! 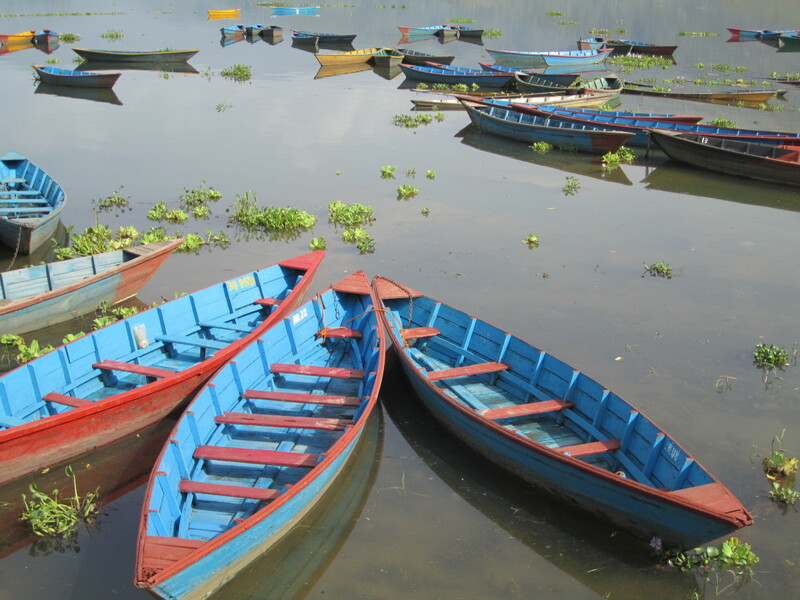 AfricaResource - Thanks so much for returning and clarifying the issue. homesteadbound - Apparently its an audio snippet from a film, it's a littler scary for those watching the video not know that however! AfricaResource - It is amazing the things that people will put on the internet ... After listening to the video, my first thought is that I would have thought there would be a lot more screaming and crying, and not just loud noises interspersed with an occasional scream. But that is just my take. Thanks so much for returning and posting the link. Others may enjoy watching it as well. Forgot to thank you in my last comment, but thanks for this interesting read! This is definitely one I haven't heard about yet, and certainly fascinating! AfricaResource - Wow! I sure would like to see that video. Since I do not believe that this truly is a gate to hell, it would be interesting to see people who really thought it to be true. thanks so much. I can see myself having to go try to track this down. There is a clip on YouTube with seismologists claiming they heard the voices through the earth here with people in hell! It's complete rubbish but very alarming at the same time! tehgyb - That is an interesting idea. And yes it certainly would beat burning coal. Thanks for stopping by and sharing your insightful comments. Hell, it beats burning coal for it, am i right!? I will have to look into that. Thanks so much! I remember seeing a TV show about it years ago. There are quite a few of these things globally? Debbie - I have included a map after receiving your question. Thanks for prompting me to include it, as it will give everyone a better idea of where it is located. Turkmenistan is on the other side of the Caspian Sea from Turkey, above Iran and Afghanistan. Eddy - Thanks so much for stopping by and commenting! A briliant hub and thank you for sharing. molometer - I haven't heard about the coal seam in Kentucky. I am going to have to go check this out. But you are right, it is nuts to think about it. It is hard to imagine. Thanks for the votes and for sharing! What a great hub and the videos are amazing. I remember reading about a coal seam in Kentucky that has been burning for decades. It's nuts when you think about it. If the door to hell had to look like something then this is pretty good. Lesley - After burning for at least 40 years now, one does have to wonder how long it is going to continue. Thanks so much for stopping by and for the votes. It is always good to see you. Hi Cindy, what an interesting article, I hadn't heard of the 'door to hell' I wonder how long it is going to burn for, fascinating! thank you for sharing and voted up. Debbie - so glad to introduce you to this awesome sight. It is truly amazing I'm sure they keep saying that it will burn out any day now, but it keeps burning. Such a waste, but who would have thought that it could release this much gas? Thanks so much for stopping by! Maximizer - thanks so much for stopping by! Wow, that looks truly epic. Thanks for SHARING. Mark Pitts - Yes, it truly is fascinating! It would be interesting to go there and see how much heat it gives off, and to see the flames. I found it amazing at the noise that the flames make as it consumes the gas. I have often thought of fire as a quiet thing with what it was consuming making all the noise you hear, but that is not so as evidenced by the video. If you find anything more, please stop back by and let us know! My Minds Eye53 - I have tried to think how they could put this fire out, and as long as any flame existed and any gas were present, I just don't see how they could put it out. It is a waste for sure. But you are right, it does serve as a vivid reminder of the power that the earth exists and we often have very little control over it. Thanks to all of you for stopping by and leaving your comments! I appreciate it! christianajohan - My understanding is that until the gas is fully consumed by the flames it will continue to burn. There is a tremendous amount of energy being burned away! Nell Rose - If you looked at any of the videos or pictures, people appear minuscule next to this huge burning hole, especially when silhouetted against the flames in the darkness. I think it would be neat to see, but I might fear that there would be additional underground cavities adjoining it that could also collapse. But I suppose after decades, if it was going to collapse, it would have done so by now. thanks so much! duffsmom - I am pleased that you enjoyed this hub. Dale Hyde - Although I do believe there is a hell, I do not believe this is the door to it. It truly is amazing what is believe the earth's crust that we cannot see. I am constantly amazed at the things that I can see. This gas that we cannot see has caused this fascinating phenomenon that is a draw for so many people. ExoticHippieQueen - I also do not believe that this is the literal door to hell, but it sure does a good job of looking like it, doesn't it? the clean life - I am happy that I was able to introduce you to this phenomenon. And it is interesting to think that all this gas is pent up under us, isn't it? What happens when all the gas has been released and the pressure is not there to support the crust? Do more areas start collapsing? Interesting and scary all at the same time! chamilj - It is truly a waste for sure, but initially they thought that it would only burn a few days, and now they may not be able to put it out as long as the gas continues to seep from the cavity. Man from Modesto - thanks for the reality check. In addition to the 9" hole that the drilling equipment created, it must have also fractured the earth's crust in that area, or fractured rocks supporting the earth above the huge cavity. Having been weakened, the earth gave way and the entire drilling site collapsed. There have been many sinkholes created where underground cavities have collapsed, so this is not a new phenomenon. The continued release of gas and the fires is what makes this one so unusual. Thanks for sharing your reality check! Interesting! I am introduced to so much new information on HubPages. Thanks for your research. I think the name suits it, but not that it is really a hell entrance. That would put some people nearer to hell than others. you would think they could harness and use the heat off of it. I know they are using lava as an energy source. I guess it is not wasteful if you were to use it as a reminder as to what mother earth can do and we have no control over it. Neat hub, I had never heard of it until this hub. I want to go there so bad and see it myself. This was fascinating, and now I'll have to research myself to find out more. Thanks! Interesting and well done hub! I don't believe in hell, so I could not say it is or could be a door to there, however, it is intriguing without any doubt! It is amazing at the resources that are beneath our feet as we walk about daily. To think that this has been continually fueled for so many years without any sign of running out of "gas" is simply hard to comprehend. But it is real. Very interesting hub. I love learning about info. like this. Hi, Wow! Mother Earth certainly does throw up some amazing things, don't know about the door to hell, but I wouldn't want to stand next to it! Brandon Spaulding - I do not believe that it is the literal door to hell either, but it is a very interesting phenomenon. Thanks so much! Made - this is truly an interesting occurrence. Pollyannalana - Thanks so much! I personally think it would be neat to see and hear this awesome display of nature. Thanks so much to all of you for stopping and commenting. This is interesting. The continuity of the gas makes it burning everyday. That is how I understood. Thanks for sharing. Vote up! Common sense check: that ginormous crater resulted from a drilling rig drilling a hole (typically less than 9" in diameter) into the earth? I don't know this is possible. Why don't they use this heat to produce electricity. What a waste of energy. Wow I have never heard of this. It is truly amazing and to continue to burn for years is more amazing. We never know what lies beneath the surface crust. Excellent hub and we written. I sure learned a lot. Thank you for sharing this with us. All I can say is WOW! That is truly terrifying. While I don't think that it's the door to hell (or do I???? ), it is concerning that it burns relentlessly with no end in sight. Just what is inside the center of the earth? Eeeeeeeeks. Voted up and awesome! This one is really a sharer. Food for thought! Great and voted up and across. I sure am not going there! I didn't know there was a "door to hell". Interesting hub! This is a very intetesting story. I thought my country's burning of gas from the oilfield is a waste of resources and money, this Door to Hell is even wasteful. But in their case, I guess that's the only solution? I don't know that I believe this is the actual door to Hell, but I can say I don't want to enter. What an awesome display of nature. Really cool hub. Thanks for researching this topic. I love nature.